In a previous post, we saw how chiles (Capsicum spp.) 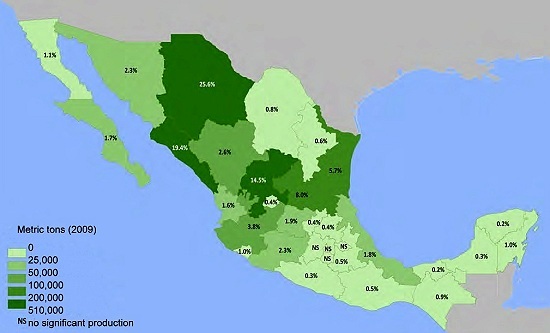 have been cultivated in Mexico for centuries (the oldest record of domestication dates back to 4100BC) and they made an important contribution to Mexico’s traditional cuisine being recognized by UNESCO as an “Intangible Cultural Heritage of Humanity.”In this post we take a closer look at where they are grown, how many are produced and how valuable the annual crop is for the domestic market and for export. The area cultivated for chiles has declined slightly over the last decade from 145,000 hectares to 141,000; about 85% of this area is irrigated. However, the volume of total production has risen by an average of 1.5%/yr, due to the application of improved techniques, knowledge and equipment, especially the increased use of greenhouses. Each year, a small percentage of the cultivated area is not harvested due to the adverse impacts of diseases, pests and climatic events. The map shows total production volume on a state-by-state basis. In summary, 2 out of every 3 green chiles grown in Mexico come from Chihuahua, Sinaloa, Zacatecas and San Luis Potosí. The average consumption in Mexico is about 15 kg/person. For the period 2000-2010, domestic consumption oscillated around 1.5 million tons/yr. As international demand rises, there is a slightly reduced supply of chiles to the domestic market. International trade in chiles began shortly after Columbus introduced them to Europe as “peppers of the Indies”. Today, as noted earlier, Mexico is the world’s leading exporter of green chiles, and ranks 6th for dried chiles. About 25% of Mexico’s chile production is exported. Over the last decade (2000-2009), exports have grown at a rate of about 15%/yr in volume, and 13% in value. In 2009, chile exports were worth 720 million dollars. Exports go to 52 countries, though a whopping 98% go to the USA, followed by the UK, Canada, Germany and Japan. Mexico also imports some chiles each year. From 2000-2009, imports (almost entirely dried chiles) averaged 30,000 tons, at a cost of around 100 million dollars. China is Mexico’s main provider, followed by Peru, the USA and Spain. ﻿Main source (pdf file): Un panorama del cultivo del chile, SAGARPA: Servicio de Información Agroalimentaria y Pesquera, June 2010.